Two newly developed europium complexes have demonstrated record high luminescence efficiencies in red, as well as possessing properties that would allow for faster cheaper manufacturing of thin OLED films. The two new complexes were developed by researchers at the Institute of Physical Chemistry at the Polish Academy of Sciences in Warsaw. 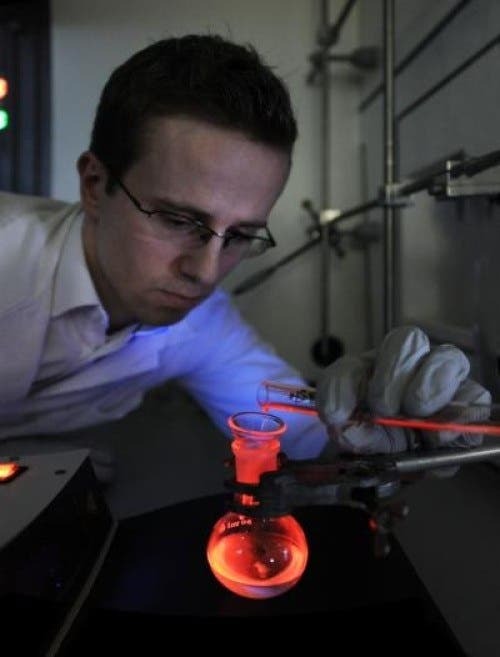 These complexes were then used by collaborators at the University of St Andrews in Scotland to create prototype OLEDs generating nearly monochromatic red light. The compounds were prepared using phosphine oxides (oxidised organic compounds containing phosphorus-carbon bonds) as co-ligands in europium ion-based complexes. “Both compounds, carefully designed by us, display in their class a record-breaking luminescence efficiency. As a matter of fact, we know red emitters with somewhat higher efficiency, containing iridium, but it’s completely different type of materials,” states Professor Marek Pietraszkiewicz from the IPC PAS. The red light emitted by these (and other) europium complexes with phosphine oxides is of a very well-defined wavelength — about 612 nanometer (a billionth part of a meter). The luminescence quantum yields of these compounds reach up to 90%. “A narrow emission wavelength range and the record-breaking efficiency result from our approach to molecular design. We attach extended, highly rigid phosphine oxides to europium complexes. As a result, the energy delivered to the molecule is not dissipated in unnecessary vibrations or rotations. Instead of delivering heat to the surrounding we have higher efficiency and virtually monochromatic light,” explains Michał Maciejczyk, a doctoral student from the International Doctoral Studies at the IPC PAS. An important advantage of the luminescent materials developed and produced in the IPC PAS is their stability — they do not degrade when exposed to oxygen or light. Equally important is, however, the possibility to produce films of these materials from solutions. Existing manufacturing technologies for production of OLED films required usually the use of high vacuum evaporation and deposition. The vacuum deposition technique is very expensive, troublesome, and not everywhere available. It also requires that material is warmed up to 200-300 degrees centigrade, a temperature not well-tolerated by all compounds. The problems disappear when the films can be deposited directly from solution — and this is possible for phosphine oxides with europium complexes. Potential applications of the new materials include not only OLED displays or lighting components, such as rear lights of mechanical vehicles, but also flexible elastic dermal patches for use in anticancer therapies. The europium complex-based compounds incorporated in such patches would generate light of exactly known wavelength that could locally activate appropriately selected active ingredients, delivered earlier with other methods to patient’s ill skin cells. During therapy, the dermal patch would require only a small power supply from a battery. Patient mobility would be minimally affected, and hospitalisation would not be needed any longer.